Antonio Brown is a Raider. We talk with Pittsburgh Steelers beat writer Ray Fiittipaldo about him and get insight from the man who covered him for years. Moe Moton of Bleacher Report gives us his reaction too as does The Sporting News' NFL writer Vinnie Iyer. Also: former Raiders WR Jerry Porter gives us his take and also tells us about his experience in asking for a trade as an NFL player. Fittipaldo covered Brown during his entire Steelers career and gives us insight into what spoiled ... See More the relationship in Pittsburgh and what the Raiders are getting with the talented Brown. Moe Moton of Bleacher Report also chimes in on the Brown trade and what it means for Derek Carr's future in the silver and black. Sporting News NFL writer Vinnie Iyer also tells us what the impact of the trade of Brown to the AFC West may be and also helps us with some final takeaways from the NFL Combine this year. Former Raiders wide receiver Jerry Porter - who also demanded a trade during his career - gives us a player's insight into the situation and how the massive contract might influence other signings and contracts for wideouts. Lastly, our own Hayden Nadolny calls in from Down Under and says the trade was brilliant for the Raiders and he'll tell us why. It's uncertain how the acquisition of Brown will impact the Raiders plans for a wide receiver-heavy draft in 2019. Even with adding Brown, the Raiders need depth at almost every position on the offensive side of the ball. Current wideouts on the roster include 2018 free agent acquisition Jordy Nelson, veterans Seth Roberts, Keon Hatcher, Dwayne Harris, and 2018 seventh-round draft pick Marcell Ateman. Only Nelson and Roberts have seen significant playing time for the team. 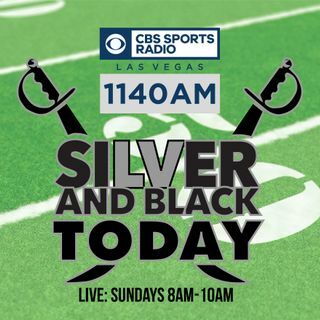 Catch the Silver and Black Today radio show which airs every Sunday from 8am-10am in Las Vegas. It can also be streamed live worldwide on the Radio.com app. Also, we stream a video simulcast of our show on YouTube.com/c/SilverandBlackToday. SilverAndBlackToday.com is our 24/7 website covering all things Raiders. We also have our regular podcast, and it and the radio show archive, are available for download on iTunes or Google Play, stream and follow on Spotify, Soundcloud & Spreaker.